If you live in the United States, but more exactly in Georgia, and you want to pay your taxes with cryptocurrencies, you may do so in the next months. According to a bill introduced on February the 21st, virtual currencies would be accepted as a valid for of payment for taxes and licenses. Some days ago we wrote at UseTheBitcoin that Wyoming has been planning tax exemptions on cryptocurrencies. But in its way to become a friendly state towards virtual currencies, it has found a rival. 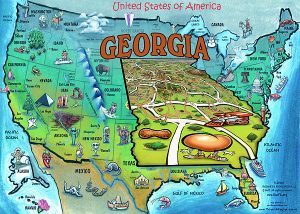 Georgia will accept cryptocurrencies for taxes and licenses. According to the bill 464, that was introduced by the Republican state senators Joshua McKoon and Michael Williams, the cryptocurrencies received will be converted to US dollars in the next 24 hours after receiving the payment. In Arizona, similar measures are being taken. According to representative Jeff Weninger, the state will send a signal to other nations to start accepting cryptocurrencies. And indeed, it is having the desired effects on other states in the country. In this way, Arizona may be one of the first states to accept cryptocurrencies for tax payments. “We are sending a signal to everyone in the United States, and possibly throughout the world, that Arizona is going to be the place to be for Blockchain and digital currency technology in the future,” said Mr Weninger. It is important to remark that paying taxes with cryptocurrencies may lead to pay more taxes. Gains in cryptocurrencies that are used to pay for taxes could increase the final amount of taxes paid. The United States is taking important measures to let the cryptocurrency market grow with less interference as possible. At the same time, other developed countries are searching for different regulations that would allow virtual currencies to be legitimized and regulated.